In honor of Sister Angela Marie Clare’s profession as a Little Sister last week, we take the liberty to share an entry from Sister’s pre-LSP blog, in which she recounted the awakening of her vocation. Wonder what happened to the hat! Hope you don’t mind, Sister Angela! 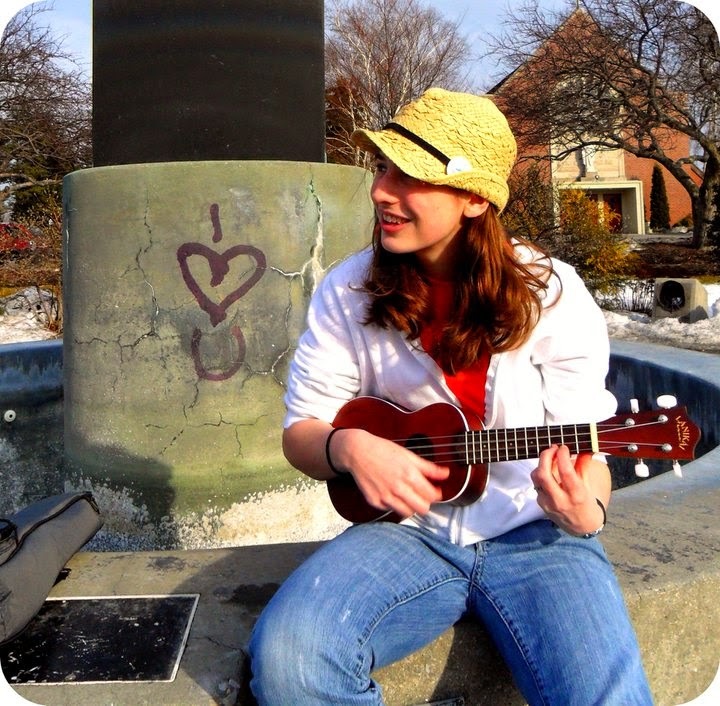 A couple months ago I was given the task of composing my vocation story to be used as a letter to rally up support. The challenge was the letter had to be one page long. I thought, ‘How in the world can I get my story to only one page? !’ By some miracle, we were able to condense it. The story does well at capturing the big picture. However, for me the big picture isn’t so important as the little moments that made up the journey. Now that I have this blog, and am not constrained to a page, I thought it would be neat to start sharing some of those little moments because its in them where I truly experienced God. 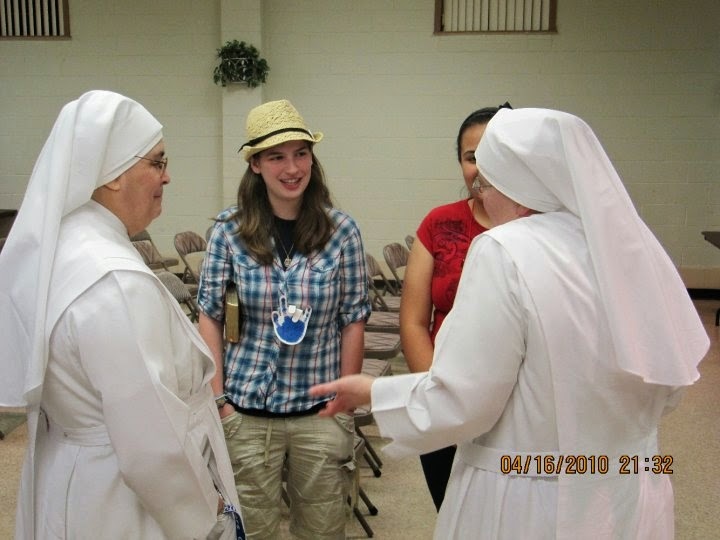 I thought I would make use of the acclaimed “Throwback Thursday!” Today marks five years since my first encounter with the Little Sisters. This picture is probably one of the most providential photos I have! Today is also the feast day of St. Bernadette, which is funny because one of the sisters pictured is Sr. Lourdes (Catholic geeking moment). When this encounter happened I was a senior in high school. At this point I was on fire with my faith. After Confirmation my life did a 180 (that’s a story for another day). I loved my God. Jesus was my best friend. I was hungry for the Truth and I participated in any opportunity to grow and learn more. I also had a hard time saying no to invitations (well, except apparently invitations from God). This led me to our high school “Adore-a-thon”: an all night lock-in spent praying for and learning more about vocations. This is where I first encountered the Little Sisters. I wish I could remember how exactly our conversation went, but I do remember putting up defenses. Inside I could hear myself saying, ‘I admire those that feel called to this life, but’s its not for me.” I also remember having the feeling of when you tell a lie and your conscious is going crazy. At that point I just didn’t realize that the feeling was because I wasn’t being truly open to God’s will. God has a sense of humor. As it says in the book of Isaiah, “For my thoughts are not your thoughts, nor are your ways my ways, says the Lord. For as the heavens are higher than the earth, so are my ways higher than your ways, and my thoughts higher than your thoughts.” (Isaiah 55:8-9) Now, I can’t wait to be a Little Sister and devote my life to making the elderly happy. I can also attest that their life is no way boring, it’s beauitful. I think it’s awesome how things have come full circle these last five years. Sure, it would have been a heck of a lot easier (and cheaper) if at that first encounter God put a big sign over top of the sisters’s heads saying “This is what you’re called to” and I decided to enter right then and there. But, that isn’t what He wanted for me. I would have missed out on all of the beautiful moments that happened these last five years. These five years have transformed me, especially through all of the people that I have met. Through all of those moments and encounters I have grown a greater appreciation for my vocation, and a greater love for my Groom. This call to become a Little Sister now means more to me than I can ever explain. When I was sharing my news with a good friend she said to me, “See, all of those late nights in the chapel were worth it.” She’s right! As challenging as some moments were, I would not change a thing. I would never trade this big circle for a boring straight line. It’s been worth it.